, an English poet and miscellaneous writer, was born at Mansfield, in Nottinghamshire, in 1703. His father is said to have kept the tree-school at Mansfield, a situation in which it is natural to suppose he could have bestowed some education on his children, yet it is not easy to reconcile this with the servile track of life into which they were obliged to enter. He is described as a little deformed man, who, after having a large family by his first wife, married at the age of seventy-five a young girl of only seventeen years, by whom he had a child. 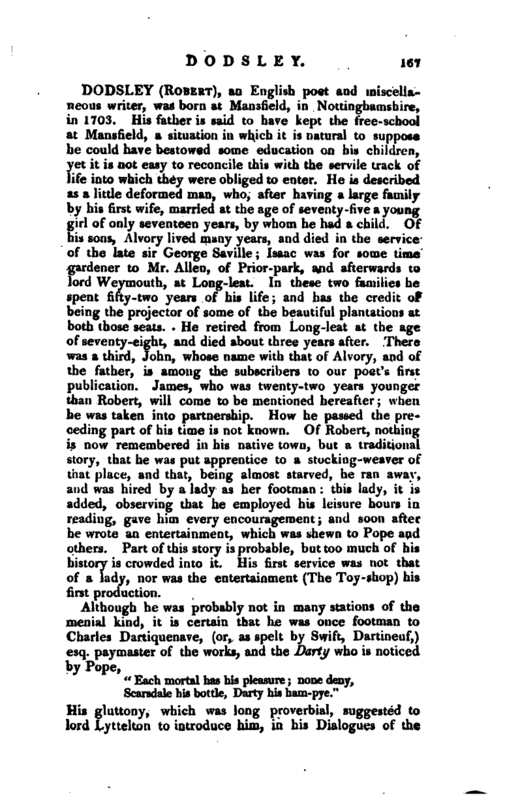 Of his sons, A Ivory lived many years, and died in the service of the late sir George Saville; Isaac was for some time gardener to Mr. Allen, of Prior-park, and afterwards to lord Weymouth, at Long-leat. In these two families he spent fifty-two years of his life; and has the credit of being the projector of some of the beautiful plantations at both those seats. He retired from Long-leat at the age of seventy-eight, and died about three years after. There was a third, John, whose name with that of Alvory, and of the father, is among the subscribers to our poet’s first publication. James, who was twenty-two years younger than Robert, will come to be mentioned hereafter; when he was taken into partnership. How he passed the preceding part of his time is not known. Of Robert, nothing is now remembered in his native town, but a traditional story, that he was put apprentice to a stocking-weaver of that place, and that, being almost starved, he ran away, and was hired by a lady as her footman: this lady, it is added, observing that he employed his leisure hours in reading, gave him every encouragement; and soon after he wrote an entertainment, which was shewn to Pope and others. Part of this story is probable, but too much of his history is crowded into it. His first service was not that of a lady, nor was the entertainment (The Toy-shop) his first production. His gluttony, which was long proverbial, suggested to lord Lyttelton to introduce him, in his Dialogues of the | Pead, holding a conversation with Apicius. The story of the Ham-pye, Dr. Wartoii assures us, was confirmed by Dodsley, who knew Dartineuf, and, as he candidly owned, had waited on him at dinner; or, as he said more explicitly to Dr. Johnson, “v*as his footman.” He served afterxvards, in the same humble station, in the family of the hon. Mrs. Lowther, where his conduct procured him respect, and his abilities, distinction. Several of his smaller poems were written while in this family, and being shewn to his mistress and her visitors, he was encouraged to publish them by a very liberal subscription, including about two hundred names of considerable note. His volume had the very appropriate title of “The Muse in Livery; or, The Footman’s Miscellany,” a thin 8vo, published in 1732. In his preface he alludes very feelingly to the many disadvantages of his humble condition; and in an emblematical frontispiece is a figure intended to represent himself, the right foot chained to despair, the right hand chained by poverty to misery, folly, and ignorance, the left hand winged, and endeavouring in vaiu to reach happiness, virtue, and knowledge. The volume contains the “Epistle to Stephen Duck” “Kitty,” a pastoral “The Petition” “Rome’s pardon,” under the title of “The Devil is a Dunce” “Religion,” a simile “The Epithalamium,” called here, an Entertainment designed for the Wedding of governor Lowther and miss Pennington; and the “Advice,” which were reprinted in his volume of Trifles." Pope’s answer to this application may appear in this place without impropriety, as it has escaped the collectors of his letter-;, and exhibits his kindness to unprotected genius in a very favourable light. I was very willing to read your piece, and do freely tell you, I like it, as far as my particular judgment goes. Whether it has action enough to please the stage, I doubt butthe morality and satire ought to be relished by the reader. I will do more than you ask me I will recommend it to Mr. Rich. If he can join it to any play, with suitable representations, to make it an entertainment, I believe he will give you a benefit night; and I sincerely wish it may be turned any way to your advantage, or that I could show you my friendship in any instance. I am, &c."
Pope accordingly recommended it to Mr. Rich, and ever after bestowed his “favour and acquaintance” on the author. The hint of this excellent satire, for it scarcely deserves the name of drama, was taken from Randolph’s “M use’s Looking-glass.” It was acted at Covent-garden theatre in 1735, and met with great success; but was yet more popular, when printed, being indeed much better calculated for the closet than the stage. There is an ease and elegance in the style which raise our opinion of Dodsfey’s natural talents; and so many circumstances of public and private absurdities are brought together, as to afford decisive proof that he had a mind far above his situation, and that with habits of attentive observation of life and manners, he cherished the justest moral feelings. 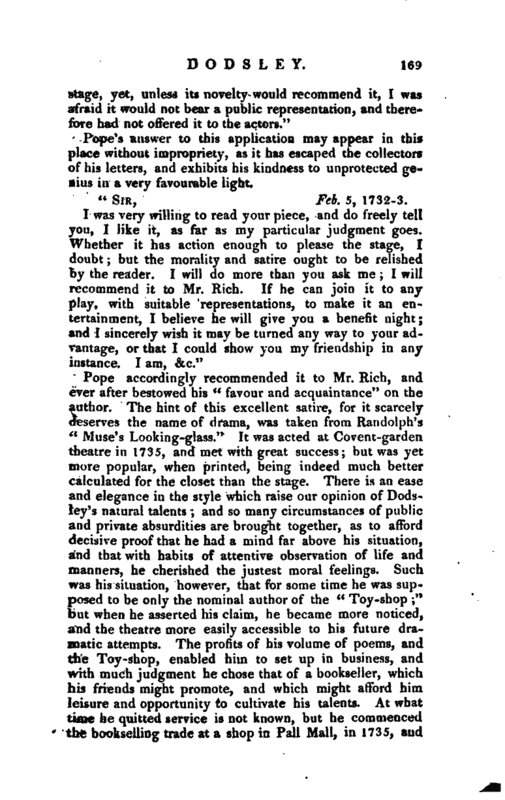 Such was his situation, however, that for some time he was supposed to be only the nominal author of the “Toy-shop;” but when he asserted his claim, he became more noticed, and the theatre more easily accessible to his future dramatic attempts. 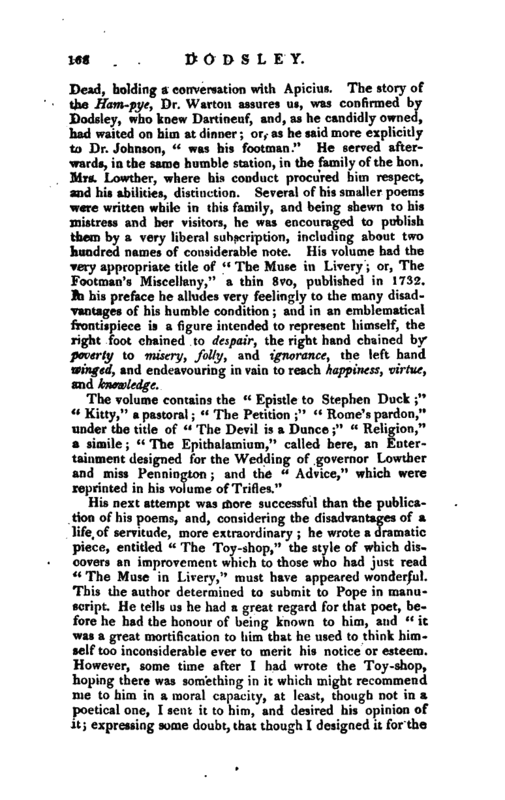 The profits of his volume of poems, and the Toy-shop, enabled him to set up in business, and with much judgment he chose that of a bookseller, which liis friends might promote, and which might afford him leisure and opportunity to cultivate his talents. At what time he quitted service is not known, but he commenced the bookselling trade at a shop in Pall Mall, in 1735, and | by Pope’s friendly interest, and his own humble and prudent behaviour, soon drew into his little premises such a society of men of genius, taste, and rank, as have seldom met. Many of these he afterwards had the honour to unite together in more than one scheme of literary partnership. In the mean time, the success of his first dramatic piece encouraged him to attempt another better adapted to stage rules. This was his farce of “The King and the Miller of Mansfield,” the plot of which is founded on a traditional story in the reign of Henry II. 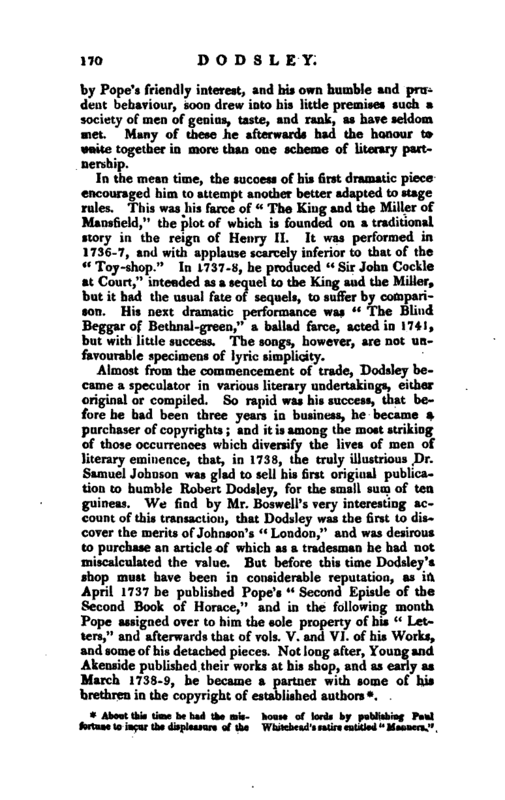 It was performed in 1736-7, and with applause scarcely inferior to that of the “Toy-shop.” In 1737-8, he produced “Sir John Cockle at Court,” intended as a sequel to the King and the Miller, but it had the usual fate of sequels, to suffer by comparison. His next dramatic performance was “The Blind Beggar of Bethnal-green,” a ballad farce, acted in 1741, but with little success. The songs, however, are not unfavourable specimens of lyric simplicity. Bt-n Victor was partly the means of pavjug him from the worst consequences of this affair, by requesting the earl of Essex (one of those libelled in the poem) to present an humble petition Dodsley, whicb his lordship did row.“ with so much effect, that Dodsley was discharged on paying his fees, which came ” to seventy odd pounds; a tolerable sum,“Victor adds, ” for one week’s scurvy lodging in the Butcher Victor’s Letters, vol. I. In 1748 our author published a work of yet greater popularity and acknowledged value in the instruction of youth, feis “Preceptor,” to which some of the parties just mentioned contributed. 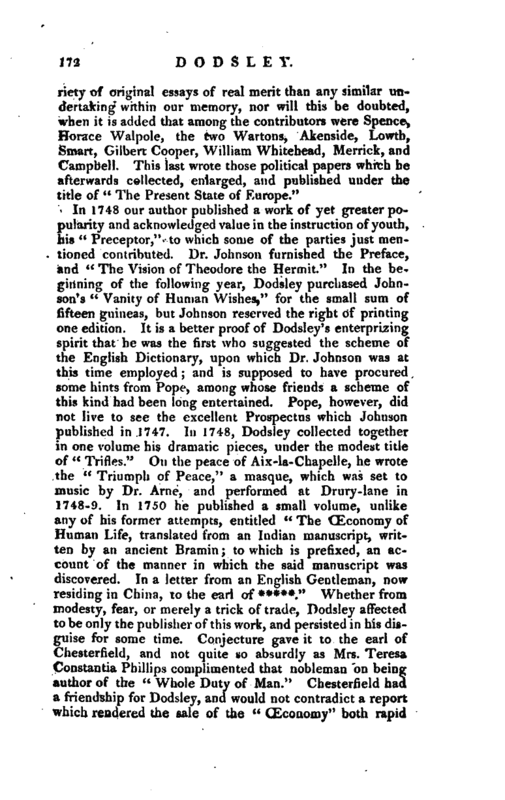 Dr. Johnson furnished the Preface, and “The Vision of Theodore the Hermit.” In the be ginning of the following year, Dodsley purchased Johnson’s “Vanity of Human Wishes,” for the small sum of fifteen guineas, but Johnson reserved the right of printing one edition. 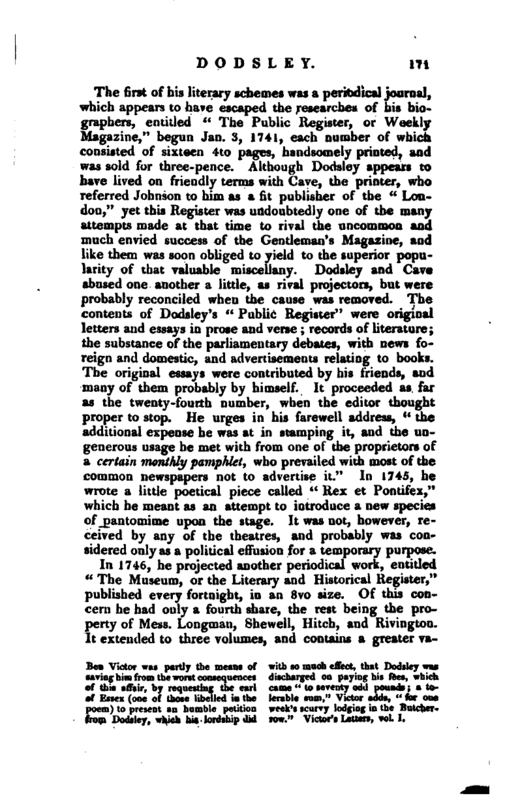 It is a better proof of Dodsley’s enterprising Spirit that he was the first who suggested the scheme of the English Dictionary, upon which Dr. Johnson was at this time employed; and is supposed to have procured some hints from Pope, among whose friends a scheme of this kind had been long entertained. Pope, however, did not live to see the excellent Prospectus which Johnson published in 1747. In 1748, Dodsley collected together in one volume his dramatic pieces, under the modest title of “Trifles.” On the peace of Aix-la-Chapelle, he wrote the “Triumph of Peace,” a masque, which was set to music by Dr. Arne, and performed at Drury-lane in 1748-9. In 1750 he published a small volume, unlike any of his former attempts, entitled “The Œconomy of Human Life, translated from an Indian manuscript, written by an ancient Bramin; to which is prefixed, an account of the manner in which the said manuscript was discovered. In a letter from an English Gentleman, now residing in China, to the earl of *****.” Whether from modesty, fear, or merely a trick of trade, Dodsley affected to be only the publisher of this work, and persisted in his disguise for some time. Conjecture gave it to the earl of Chesterfield, and not quite so absurdly as Mrs. Teresa Constantia Phillips complimented that nobleman on being author of the “Whole Duty of Man.” Chesterfield had a friendship for Dodsley, and would not contradict a report which rendered the sale of the “Œconomy” both rapid. | and extensive. The critics, however, in the Monthly Keview, and Gentleman’s Magazine, were not to be deceived. About this time, he established, in conjunction with Moore, a periodical paper, entitled “The World,” a name which Dodsley is allowed to have suggested after the other partners had perplexed themselves in vain for a proper one. Lord Lyttelton, although no contributor himself, used his influence with his friends for that purpose, and Dodsley procured papers from many of his friends and customers. One paper only, No. 32, is acknowledged to come from his own pen. By undertaking to pay Moore a stipulated sum for each paper, whether contributed by that writer, or sent by volunteers, J)odsley secured to himself the copyright, and was amply repaid not only by its sale in. | single numbers, but by the many editions printed in volumes. When it was concluded in 1756, he obtained permission of the principal writers to insert their names, which gave it an additional interest with the public. A few chose, at that time, to remain concealed, who have since been discovered, and some are yet unknown. Chesterfield and Horace Walpole were known at the time of publication. 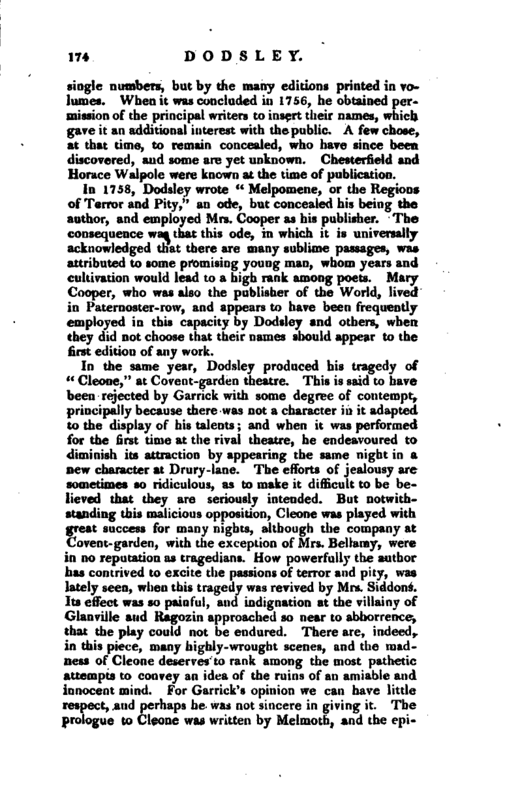 In 1758, Dodsiey wrote “Melpomene, or the Regions of Terror and Pity,” an ode, but concealed his being the author, and employed Mrs. Cooper as his publisher. The consequence was that this ode, in which it is universally acknowledged that there are many sublime passages, was attributed to some promising young man, whom years and cultivation would lead to a high rank among poets. Mary Cooper, who was also the publisher of the World, lived in Paternoster- row, and appears to have been frequently employed in this capacity by Dodsiey and others, when they did not choose that their names should appear to the first edition of any work. This was an important year (176S) to our author in another respect. He now published the first volume of the *’ Annual Register," projected in concert with the illustrious Edmund Burke, who is supposed to have contributed very liberally to its success. This work was in all its departments so ably conducted, that although he printed a large impression, he and his successor were frequently obliged to reprint the early volumes. Its value as an useful and convenient record of public affairs was so universally felt, that every inquirer into the history of his country must wish it had been begun sooner. 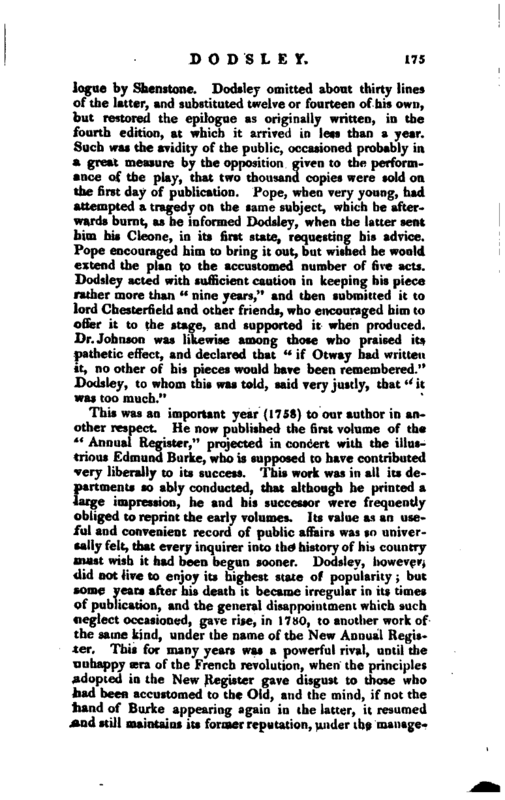 Dodsley, however, did not live to enjoy its highest state of popularity; but some years after his death it became irregular in i,ts times of publication, and the general disappointment which such neglect occasioned, gave rise, in 17 Ho, to another work of the same kind, under the name of the New Annual Register. This for many years was a powerful rival, until the unhappy sera of the French revolution, when the principles adopted in the New Register gave disgust to those who had been accustomed to the Old, and the mind, if not the hand of Burke appearing again in the latter, it resumed and still maintains its former reputation, under the | managemerit of Messrs. Rivington, who succeeded the late James Dodsley in the property. In 1760, our author published his “Select Fables of Esop and other Fabulists,” in three books, which added very considerably to his reputation, although he was more indebted than has been generally supposed to his learned customers, many of whom seem to have taken a pleasure in promoting all his schemes. The Essay on Fable, prefixed to this collection, is ascribed to Dodsley by the author of his life in the Biographia. 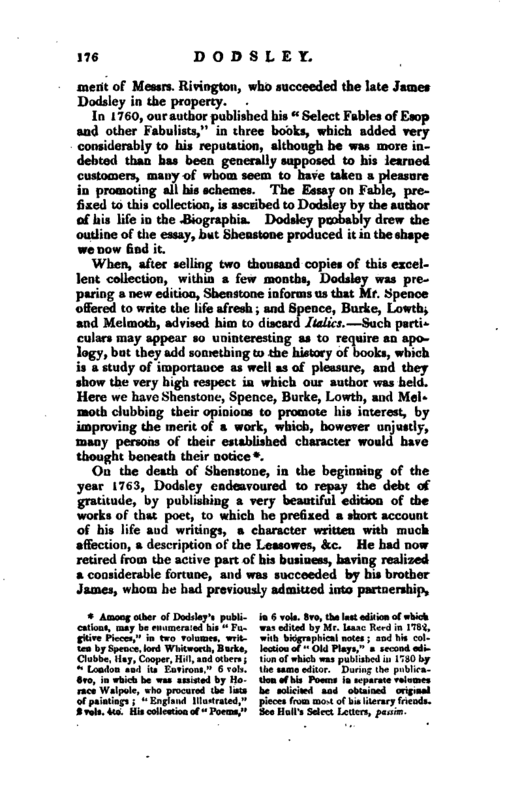 Dodsley probably drew the outline of the essay, but Shenstone produced it in the shape we now find it. 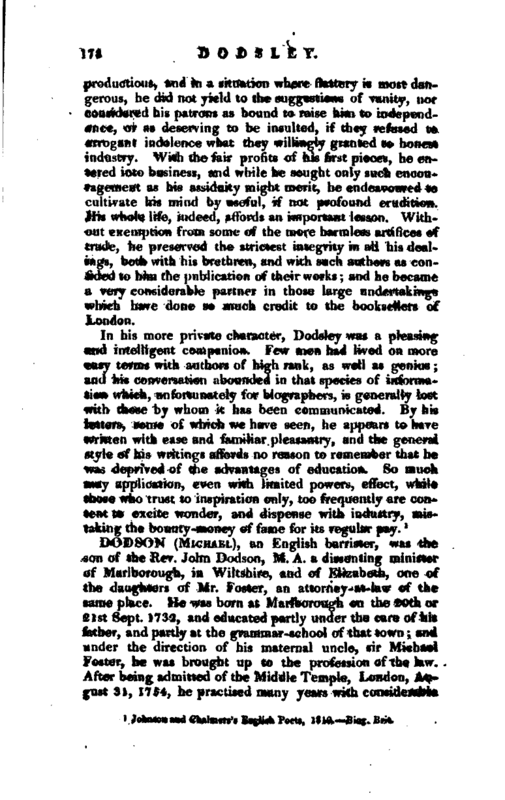 Among other of Dodsley’s publications, may be enumerated his “Fugitive Pieces,” in two volumes, written by Speuce, lord Whitworth, Burke, Clubbe, Hay, Cooper, Hill, and others; “London and its Environs,” 6 vols. 8vo, in which he was assisted by Horace Walpole, who procured the lists of paintings; “England Illustrated,” 2 vols. 4to. His collection of “Poems,” in 6 vols. 8vo, the last edition of which was edited by Mr. Isaac Reeu in 17S'2, with biographical notes and his collection of“Oltl Plays,” a second edition of which was published in 17SO by the same editor. During the publication of his Poems in separate volumes he solicited and obtained original pieces from most of his literary friends. See Hull’s Select Letters, />wi/A. 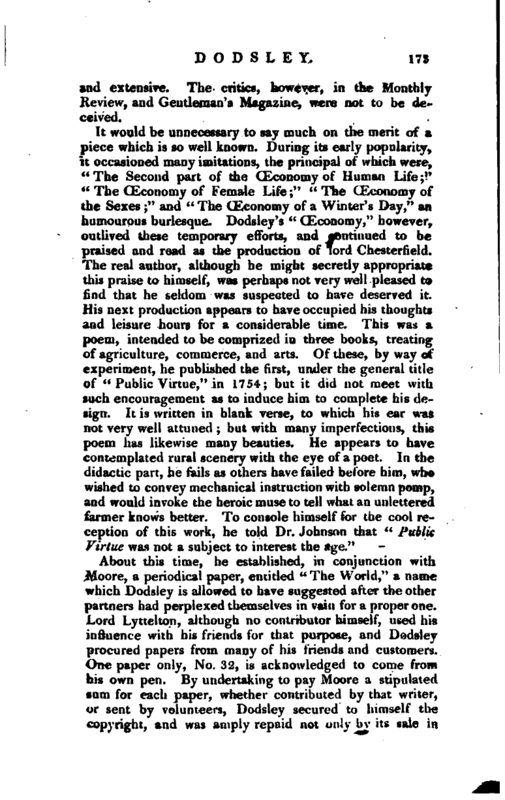 On the death of Shenstone, in the beginning of the year 1763, Dodsley endeavoured to repay the debt of gratitude, by publishing a very beautiful edition of the works of that poet, to which he prefixed a short account of his life and writings, a character written with much affection, a description of the Leasowes, &c. He had now retired from the active part of his business, having realized a considerable fortune, and was succeeded by his brother James, whom he had previously admitted into partnership, | and who continued the business until hi’s death in 1797, but without his brother’s spirit or intelligence. During the latter years of our author’s life, he was much afflicted with the gout, and at length fell a martyr to it, while upon a visit to his learned and useful friend the rev. Joseph Spence at Durham. This event happened September 25, 1764, in the sixty-first year of his age. He was interred in the abbey church-yard of that city, with a homely tribute to his memory on his tomb-stone. In 1772, a second volume of his works was published, under the title of “Miscellanies,” viz. Cleone, Melpomene, Agriculture, and the Œconomy of Human Life. Two of his prose pieces, yet unnoticed, were inserted in the later editions of his first volume; the “Chronicle of the Kings of England,” in imitation of the language of Scripture, and an ironical Sermon, in which the right of mankind to do what they will is asserted. Neither of these has contributed much to his reputation. After the incidental notices taken of his different writings in this sketch of his life, little remains to be added as to their general character. As a poet, if poets are classed by rigorous examination, he will not be able to maintain a very elevated rank. His “Agriculture” was probably intended as the concentration of his powers, but the subject had not been for many years of town-life very familiar to him, and had he been more conversant in rural œconomy, he could not give dignity to terms and precepts which are neither intelligible nor just when translated from the homely language of the farm and the cottage. Commerce and the Arts, had he pursued his plan, were more capable of poetical illustration, but it may be doubted whether they were not as much above his powers, as the other is beneath the flights of the heroic muse. The “Art of Preaching” shows that he had not studied Pope’s versification in vain. It is not, however, so strictly an imitation of Horace’s Art of Poetry, which probably he could not read, as of Pope’s manner of modernizing satire. It teaches no art, but that which is despicable, the art of casting unmerited obloquy on the clergy. Upon the whole, the general merit of his productions, and the connexions he formed with many of the most eminent literary characters of his time, have given a considerable popularity to the name of Dodsley; and his personal character was excellent. Although flattered for his early | productions, and in a situation where flattery is most dangerous, he did not yield to the suggestions of vanity, nor considered his patrons as bound to raise him to independence, or as deserving to be insulted, if they refused to arrogant indolence what they willingly granted to honest industry. With the fair profits of his first pieces, he entered into business, and while he sought only such encouragement as his assiduity might merit, he endeavoured to cultivate his mind by useful, if not profound erudition. His whole life, indeed, affords an important lesson. Without exemption from some of the more harmless artifices of trade, he preserved the strictest integrity in all his dealings, both with his brethren, and with such authors as confided to him the publication of their works; and he became a very considerable partner in those large undertakings which have done so much credit to the booksellers of London. 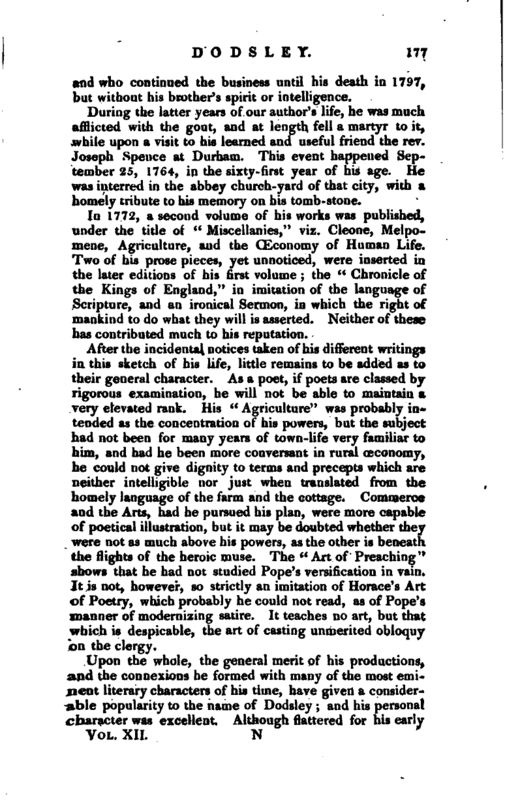 Johnson and Chalmers’s English Poets, 1810.—Biog. Brit.